<Update: 2015-06-15> My colleague Joe Rodgers pointed out that the below steps do not work in SharePoint 2013 style workflows. As it turns out there was an issue with the link that was generated for the “Workflow Context: Current Item Url”. This issue is addressed in the SharePoint 2013 June 2014 CU (requires Service Pack 1 or the March 2013 PU). See below for more details. 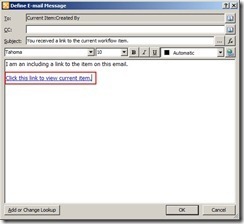 In this post I’ll walk you through the process of sending an email that contains a link to the current item from a SharePoint Designer 2010 workflow. This is a process that has been published on many other forums and blogs, but many that I have seen are more complex than seems necessary. A common request from SharePoint users is to get an email which contains a link to review/approve/edit the workflow item. SharePoint list items contain an automatic property for Url Path, but unfortunately that Url is not properly formatted to retrieve the item if you include it directly on the message body. I tried a few solutions suggested from other blogs or forums that took a substring of the Url Path property, concatenated the display form view Url, and mixed in some other strings. While I was able to get this working in some scenarios I still had issues in general. My solution involved adding a hyperlink to the message body. This ended up being far easier than I had expected and fairly intuitive once I found the correct property to use. Follow these steps to see what I did. First add a “Send an Email” action to your workflow. Edit the action to pull up the email configuration dialog. Click the “Add hyperlink” button seen below. When prompted for the address of the link click the fx button to perform a lookup. Choose Workflow Context from the “data source” dropdown. Choose Current Item URL from the “field from source” dropdown. Click OK. Your Edit Hyperlink dialog should now look something like this. 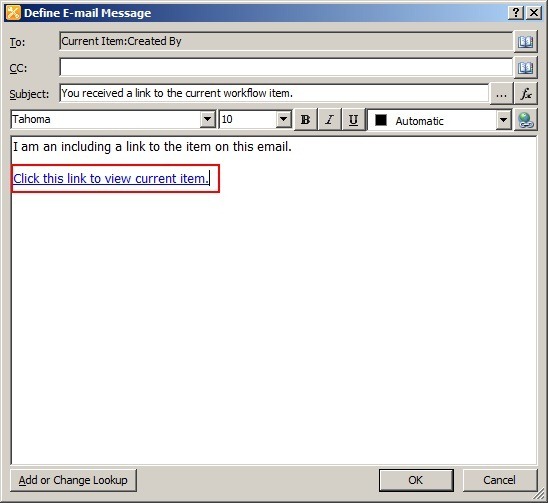 The end result will be a hyperlink added to your email pointing to the current workflow item. Note: this link points to the non-modal dialog display form (display form similar to what you had in 2007). 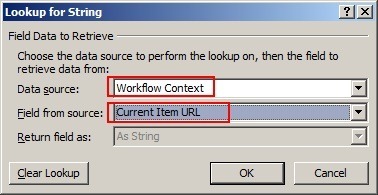 If you attempt to use this process for SharePoint 2013 style workflows (based on Workflow Manager and not the out of the box SharePoint 2010 workflow engine) you will notice that the URL generated is incorrect (ex. “Lists/MyList/1_.00”). It will look something like the following. The solution to this is to install the SharePoint 2013 June 2014 CU (I tested with the Server package but it may be included in the Foundation package as well). After you install this cumulative update you may notice that the URL generated only includes from the list level and down (ex. “LIsts/MyList/DispForm.aspx?ID=1). As such you will need to combine this with the site URL. See below for example of the new URL that is generated. 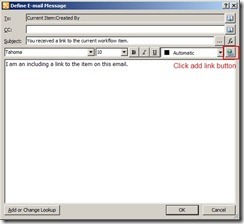 In this post I walked you through the steps to create a SharePoint Designer 2010 workflow with an email that contains a link to the current item. While there are many other options for accomplishing this out on the web I found this to be a more concise process and easy to understand. Hopefully you found this helpful as well. Feel free to leave any comments or feedback if you’ve found other ways that were helpful to you. I ran into the same issue at first. Glad to help you out. How do you do this in SPD 2007? 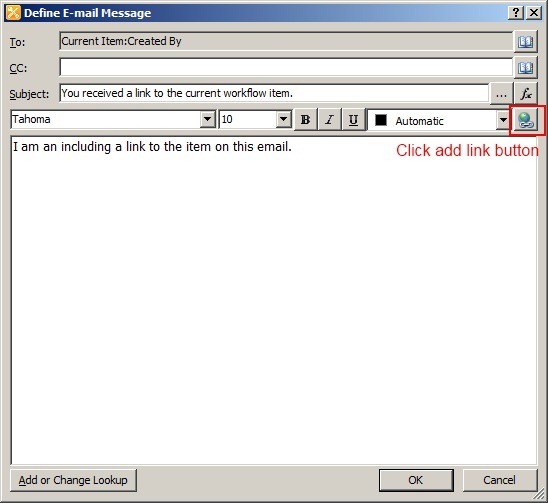 Since there is no action to "add a link" in SPD 2007 you may want to try building the hyperlink () as a dynamic string and insert that into the body of the email. I haven't gotten a chance to try this myself, but let me know if that works for you. One question/issue.... The List Name has a space in it .. "Trouble Ticket"
If you want to use another list you will lose the "Current Item URL" context. Instead you will need to build the URL manually / semi-manually. Read through this forum post for help on how to do that. Did you change the name/URL of your list after creation? I created a sample list with spaces in the name, sent an email with link to that list, and got the proper "%20" to replace the spaces. Clicking the link successfully brought me to the item. What if the ID you are trying to retrieve is from the task list? I have a workflow that is attached to a form library. When a form is submitted to the library it kicks off a task item. I want to include a URL to that task item in the email that is sent out in the form library workflow. All the blogs and suggestions I have read is based on the workflow running on the Task List, so the ID lookup is automatically inherited. Do you know how to get the ID in my situation? I have been hitting my head on the wall about how to get this done. Also, a concern that i have is that even if I get it done, will there be a sychronization issue since I notice the workflow fires of the email immediately even before the task item is created? You could create 2 workflows. The first workflow runs on your form list and creates an item in the tasks list. The second workflow could then run on the tasks list when an item is created. The task list workflow would use the emailing functionality described in this post to send out a URL to the task item. This should also take care of the issue with the task item existing before sending an email. Thx a lot. Your post saved me loads ot time. Depending on the content type you are working with you should be able to include a "preview". In the case of an item on a custom list you can include a lookup to the title field and perform a substring on it for the first X number of characters. Do you know of any way to make the link use the modal popup version of the form? I also notice that when you select "Close" at the bottom of the item after following the link, you automatically go to the "All Items" view of the list the item came from. Any idea how to make it go to one of the other created views instead? Is it simply whichever view is set as the default view? 10/13/2011 5:31 PM | Nathan A.
I do not know of a way off the top of my head to send the modal popup version of the link. There may be one but you'd have to do some research. If you find a way please share. As for the All Items display I assume that is because it is the default. Hey thanks for the tip. Now i am stoned. I need to add an image into the email that the workflow is generating and sending as part of the notification process. I have tried using the Advanced Features of "Send An Email" action to embed the image source in Sharepoint Designer 2010 all to no avail. I'm not aware of any functionality to send an image in the email. Sorry I can't be of more help. The instructions I posted were tested against a custom list. Did you implement yours on a forms library? Sounds to me like what you are seeing. In order to view forms through the browser you must have SharePoint Enterprise and configure InfoPath Forms Server service running. Also your form must be browser enabled. Let me know if that is not the case. Paul, glad I could help you out and save some frustration. The link I used goes to the display form for the list. If the user has appropriate edit permissions to the item then they should be able to click the edit item button. It sounds to me that your user only has view permissions since the edit button it dimmed. Hi, the current URL will link the internal address, any ideas how can I create a hyperlink that will have the same structure but have the link use our extranet address? So for example it's currently http://<servername>/sites/department/document library when it I want it to display http://<external access name>/sites/department/document library. Using the above described process I don't believe it is possible to use the external (alternate access mapping) URL. You could create a custom SPD workflow action in Visual Studio, deploy to your farm, and then use that step in SharePoint Designer workflow to grab the external AAM URL. That would require a bit more development and configuration though. Does anyone know how to deliver the correct URL. Are you using Alternate Access Mappings (AAMs) in your farm? It sounds like you have multiple zones configured and the default zone (ntlm) is being used instead of an intranet / custom zone. See my comment to Fawaz above. You would either need to change your AAM zones or create a custom solution to pull a specific zone rather than the default. Hope that helps. Is your workflow firing before or after the item is created (ItemAdding or ItemAdded)? If before then there is no item (and thus no URL) for it to interact with. If after then you should be able to get URL via that property. how can i add accept and reject link so that user can directly accept / reject from email. You can add additional info in the body by building a custom string with the Add or Change Lookup button. Inside that you can use a formula to reference other object properties such as start/end date, etc. For accept or reject buttons you would be better suited using an out of the box approval workflow. You can even modify these with SharePoint Designer 2010 if they need tweaking. Not sure I understand you question. Have you replaced your default item forms (.aspx pages) with InfoPath forms? When I tested this I was using the default ASPX pages so I did not see any InfoPath. If you have browser enabled forms though you shouldn't need to have InfoPath on the client. Thank you for this article, it has helped immensely with my current project. Slightly related, I have a current stumbling point which I am hoping someone might be able to help with. In addition to adding the email link to an item, I would also like to add into my text the name of the subsite that the email is being generated from (I have multiple similar subsites, and would like to be able to distinguish within the email text which one is generating the email to help the end user process the information). Is it possible to add the subsite name? I don't see the subsite name as a field you can choose. A few options. You could name the list after the subsite (ex. "Subsite A Expense Reports") and then include the list name in email. Also could grab the URL and parse out the site url from that (assuming url and title are similar enough). Other than that don't know what you could bind to. I haven't tested this much with discussion lists. The problem is that they don't follow the convention of using IDs in the URL but instead FolderIDs. You want to use the Threaded.aspx page but I'm unsure how to retrieve the folder ID using SharePoint Designer. I recommend users to build lists, sites, etc. with no spaces in the names. Afterwards rename the title to include spaces. This (usually) helps avoid issues like you are experiencing but also helps developers with the underlying naming they need to use. I'm not sure what you are asking for. Can you be more specific? Thank you so much for posting this!! 8/21/2012 12:07 PM | Amy S.
The method I described above only takes you to the default display form. To get to a different form you would need to use something like a Visual Studio workflow action that is usable in SharePoint designer or manually build the URL string in your SharePoint designer workflow. 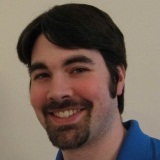 Can i ask you a another sharepoint question? When you use a reusable workflow SharePoint Designer is associating it to a content type of sorts, not to the list specifically, so you won't see all of the columns. If you use a list workflow you are associating directly to the list so you have access to all of the columns. If you are not using the Title field for other purposes you could rename the Title column to Name and work with it in a reusable workflow. I have not seen that where the column value returns a # symbol. What type of column is it (person, string, etc.)? Does the column allow multiple items? Your Solution worked beautifully. Thanks for that. Thank god I found you. Glad you got a working link. To include other properties from the workflow item you may need to link to the list via the ID of the current item. From there you can then select properties from that list to display. I did exactly what was stated and it just wouldn't work. I messed with it and came up with a different solution. c. Text to Display: Enter Title of document you are creating the link for. d.Press EDIT to search for the folder where the document is. e. Double click the Folder and select the document. g. The link is now in the email. h. Check for ERRORS and PUBLISH. Glad you were able to get something working, even if not the steps I walked through. You should be able to do a reference "Current Item" or reference the list you are working with via its ID and then grab any info or columns that you want from there. Let me know if you need more details. Thanks for this "tutorial". You revealed two really obvious items that I had not seen previously and they solved my problem of getting a link to be a link. One change I did make is NOT selecting Current Item URL because when I used that to open my newly posted document InfoPath was opened on my local machine to display the document. So instead I entered the URL of the top level of the library in the Address field where the new document was posted. This opened SharePoint right at the library and the new document was only a double-click away. Thanks again. Your "tutorial" works where several others only almost work. Glad to be of assistance on this. Yes working with InfoPath forms adds a little extra layer of complexity, especially when trying to figure out in browser vs. client rendering. Hi, I've got the url working nicely in my workflow generated email however I'm wondering if it's possible to actually send say a pdf document instead of a link in the email? Unfortunately no it is not possible to send an attachment using the methods I showed above. I'm not aware of anything by using out of the box or SharePoint Designer workflows. Please see some of the above comments that discuss sending a link to the Edit form. I am not aware of a way to do this with SharePoint Designer (without hand creating the URL). The other option is using a Visual Studio workflow and using lookups to pull the edit form URL. If you need to have a different URL than the default zone you'll have to build that yourself through custom code or some other means. This the best working solution I ever found! Very useful post, thanks! I have a query though - suppose the email alert is being designed for new document additions to a library, how can I also add a link to the library itself (apart from a direct link to the document)? I can't find a field in the workflow designer that links to the library name for the file in question. is there a way i can change the link to point to edit from instead of the display form? Thank you for your help! I have been working on this issue for a wek and found your post!! Is there an option to reply to a sharepoint by email and for the workflow to change a variable status based on this reply? for instance- if the reply should be "approved" or "rejected" - can it use the word typed in the reply email to change a variable status in the workflow?